(1) A good quality print-on-demand paper copy for $11.80 (about £7.20) is also available from HP MagCloud. Sorry that the sums are in dollars but we understand the printing is done in Europe and delivery is reliable and ususally a within a week from order. (2) The complete issue as a .pdf including editorials, content lists, and a back page briefing: SJM2: the desistance issue.pdf (2MB). Editorial Fergus McNeill asks if we can imagine ways to escape the contradictions between penal aspirations and realities. Can we reform criminal justice so that justice is done while change is also nurtured and supported? 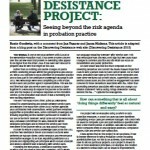 Discovering Desistance: reconfiguring criminal justice? (1.1MB) Fergus McNeill, Stephen Farrall, Claire Lightowler and Shadd Maruna draw on the Desistance Knowledge Exchange Project to pose ten provocative propositions that demand action and which state in a clear and challenging way how the criminal justice system could and should be better focused on helping people stop offending. 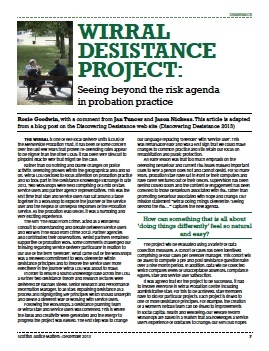 The Wirral Desistance Project: seeing beyond the risk agenda in probation practice (1MB) Rosie Goodwin, Jan Tuncer and Jason Nickeas reflect on the impact desistance thinking has had on their work as probation officers. 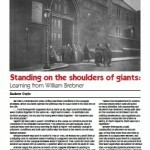 Reframing Custody (1.2MB) Colin McConnell, Jim Carnie and Hazel Mehta of the Scotish Prison Service discuss reframing the role of custody within the desistance paradigm. The Importance of Social Relations in Personal Change (1.6MB) Beth Weaver considers her research and argues that desistance is means of securing personal relationships rather than an end in itself. Putting The Pieces Together (1.3MB) Cara Jardine considers the absent voices of prisoners’ families in discussions about desistance. 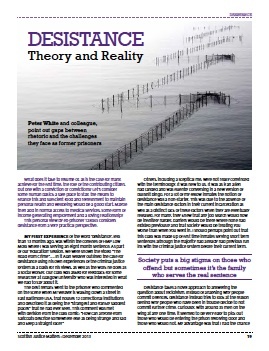 Desistance Theory and Reality (1.1MB) Pete White and colleague from Positive Prison? Positive Futures? point out gaps between rhetoric and the challenges they face as former prisoners. Desistance and Young People (1.1MB) Briege Nugent and Pamela Barnes reflect on Includem’s work with children and young people and the limitations of desistance theory. Take Five (1MB) Leading MSPs respond to our asking: What can the Scottish Government do to make it more likely than at present for people with criminalconvictions to stay out of trouble? Victims’ Rights (1MB) Frida Wheldon from Victim Support explains the new 2012 EU Directive and its impact on victims in Scotland. A New Childrens’Panel for Scotland (94KB) Bernadette Monaghan of Children’s Hearings Scotland reviews the challenges and opportunities following reform of the system. 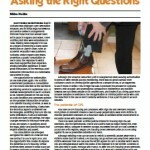 We have the will and the way,so what’s stopping us from reducing re-offending? (96KB) John Downie of the Scottish Council for Voluntary Organisations argues that the shift required in how we deliver public services isn’t happening quickly enough. 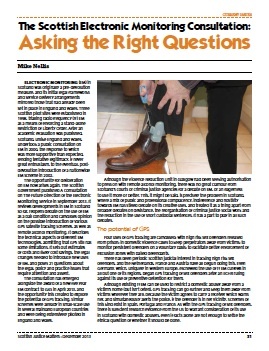 The Scottish Electronic Monitoring Consultation: Asking the Right Questions (1MB) Mike Nellis reviews the proposals for EM in Scotland and distinguishes these from the approach in England and Wales. Visiting My Son In Prison (97KB) A mother describes the routine of prison visiting and the impact on her family. 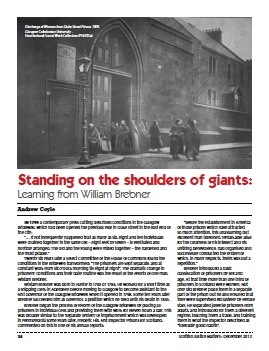 Standing on the Shoulders of Giants: learning from William Brebner (1.7MB) Andrew Coyle suggests that the work of the early Scottish prison reformer still has resonance today. Pas de Problème: the oldest problem solving court is French and desistance orientated (1MB) Martine Herzog-Evans on the role of the French Juge de l’application des peines and how this connects to desistance. Review of Policing Scotland (2nd edition) (2011), D.Donnelly and K.Scott (eds), London: Routledge (1MB) Diarmaid Harkin. Testing Times (1MB) David Strang talks to Nancy Loucks about his new role as Chief Inspector of Prisons for Scotland. 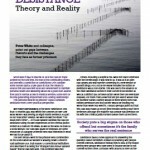 1 Pings/Trackbacks for "December 2013: desistance issue"